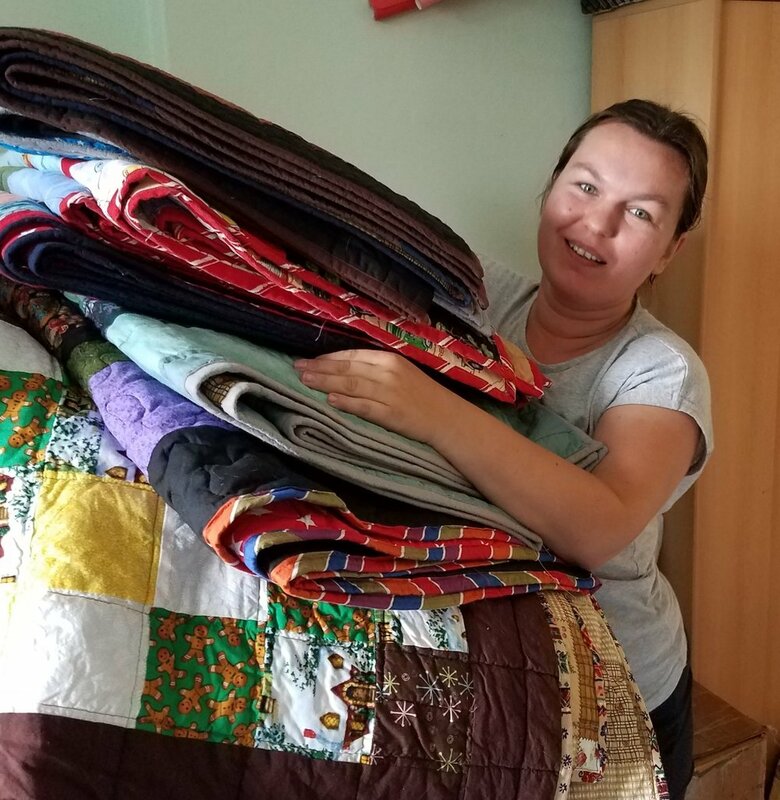 So you want to help with charity quilts? That's fantastic! I'm so excited - and the recipients are always very grateful! Here's one of our Polish helpers helping getting things set up. Thanks Monika! I'm thankful because your taste and fabrics aren't the same as mine which means we make different styles of quilts. If you happened to read my blog post about the Charity Quilt Give Away a couple of days ago, you may wish to help. Here's how you can participate if you care to. 1. You can give quilt tops. Any size. Any color. Any style. Ugly or pretty. Simple or complex. Cotton or cotton/poly or really anything - if you make the top I can use it. I can use any size you send, but if they are baby or lap size, I will increase the size to what I call a European Twin (about 60+"x 80+") or a double (about 80"x 85-95"). This seems to be the size that people are familiar with. There is no point in my insisting to someone here that a twin is 66"x90" when they don't know what to do with that much quilt! That would be my rude to insist that "our way" is right - when it isn't. It's not a right/wrong issue. The only thing I really need from you is a well made top. Please don't use eyelet or "sheer" fabric unless you put something else under it - we can't have the batting coming through the top! Tip 1 - They seem to love dark colors. Everyone does. Men and women. Children are children - they still love their typical things. Especially animals. And Spiderman. Tip 2 - Don't overthink your top. You made one and hate it and think no one else will like it? Think again. Beauty IS in the eye of the beholder. Corners cut off? I don't think many of my friends even notice. Simple squares or a bordered panel - they are great. Big squares of solid colors work - it's easy and effective. Everyone seems to like them! Tip 3 - I always need men/boy/guy quilts. Always. Think 13 year old boy up to adult man. I was hit very hard this past week with those and have maybe 1 left. If you have a top you want to donate, you can send it to my sister in FL and she will send it to me. This lady needed 7 quilts and was happy to pose. She was excited to get these beautiful quilts! 2. You could donate money for batting and backings. If you wanted to do this, you can give via paypal. This isn't really a plea for funds for this - but you could - if you wanted to. Just put on the comment what it's for and I can use it. A whole roll of 50 meters of batting will do about 20 of the single size quilts. It costs just over $50 at the current exchange rate. Obviously the bigger quilts will use more batting. 3. You can always send encouragement. It doesn't cost anything at all except time. Check us out on Facebook and 'like" Fundacja Opoka Quilts" page. Obviously you can keep up with us at the Quilted Twins either here on the blog, on Twitter (I'm working on learning that), or on Facebook. Thanks so much to those of you who have already helped out with quilt tops in the past. You have been such a blessing and help to me and many people here in Poland! And once again...feel free to check out the goodies my sis has in her store back in Florida! Rachael's Music quilt - All finished!